When a Dance Machine DJ entertains it’s more than just music, it is a performance. You can count on our Disc Jockey’s to be experienced, on time, dressed in an appropriate manner and eager to make your party a big success. Whether it comes to volume control, taking requests or any other aspects of our show, our DJs pride ourselves on courteous, professional service at all times, as satisfied customers will agree. 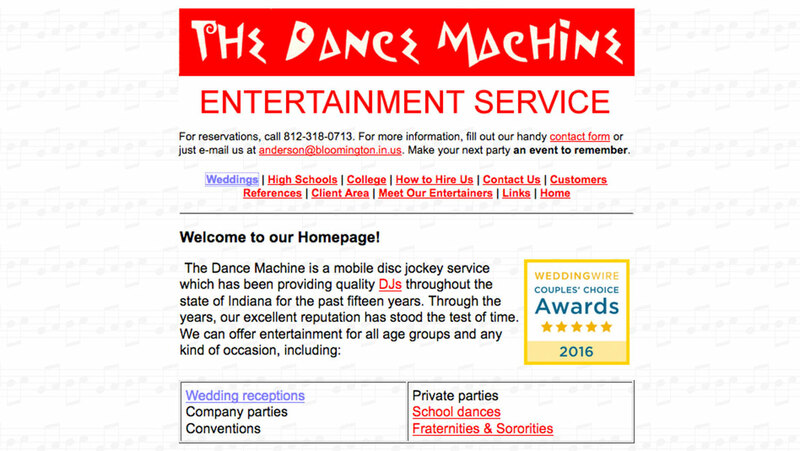 But, the best feature of the Dance Machine is the price. For a specific quote for your event or to make reservations, call 812-318-0713, or e-mail us at anderson@bloomington.in.us. And make your next party an event to remember.